Sitting behind a counter on a stool tilted back, leaning against the wall behind him, Paul Shinichi waits. The day is unpredictably rainy, off and on, on and off, just like his customers. He grows anxious—he wants to stick a needle through someone. Senior Piercer Paul Shinichi cleans his workstation. As senior piercer at Braindrops Tattoo & Piercing at 1324 Haight St., Shinichi argues that it is time for a change in the industry and raising the standards is the way to go. In a time of economic struggle coinciding with the popularization of the body art industry in the media, Shinichi is one of many who seeks respect for his profession by supporting The Safe Body Art Act to create a “fair playing field,” he says. The act which went into preliminary stages on Jan. 1, enforces stringent regulations on the body art industry to ensure that all practitioners follow the same precautionary procedures. Justin Malan, executive director of the California Conference of Directors of Environmental Health, helped propel the act and is taking measures to institute proper training throughout the industry. Furthermore, according to the guidelines of the code, there are restrictions mandating when it is necessary to change gloves and how to properly dispose of biohazards and sharp-single-use objects. The rules in place affect the facilities financially due to costs of equipment, according to the practitioners. Paul Stoll, owner of Body Manipulations, helped write the Safe Body Art Act over the past four years. Stoll says that the act creates a “level playing field,” because every practitioner has to make the same expense in complying to the regulations, so price competition amongst shops will decrease. Many tattoo artists and piercers are on board for the change, but some are a bit skeptical. Kevin Green pierces Adriana Crespin. In response, Cathy Montie, blood-borne pathogens trainer for the Occupational Safety and Health Administration, acknowledges the skepticism and realizes it is due to the “expenses and fees,” artists pay. “They are really good at taking our money but don’t provide the service,” she says laughing, referring to restrictions in place by county ordinances. However, Montie believes in the purpose and supports the act by serving as a trainer to the practitioners. “It will get rid of all the ‘scratchers’ out there and make the reputable shops more reputable,” Montie says. 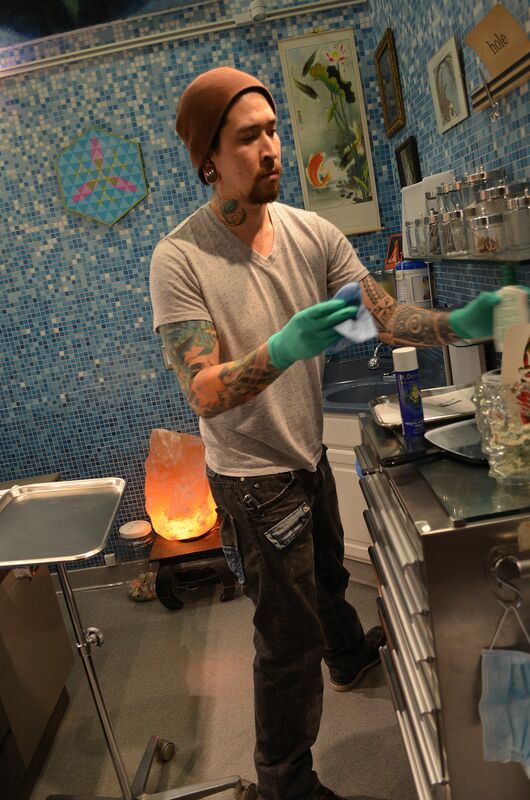 Like Green, tattooer Bobby Paulmenn, also from Mom’s Body Shop, is a little doubtful about the law coming into play. Other shops in the Upper Haight are also on board. Becky Dill of Cold Steel America Piercing and Tattoo is proud to be a part of The Association of Professional Piercers and a founder of The Bay Area Piercing Group. “I come often for the street wear and clothing, or to get pierced or tattooed,” says Adriana Crespin, a San Francisco resident. Paul Shinichi remains hopeful for the law, which will go into full affect July 1.